All health insurance plans must include 10 specific categories of coverage in order to be compliant under the Affordable Care Act. 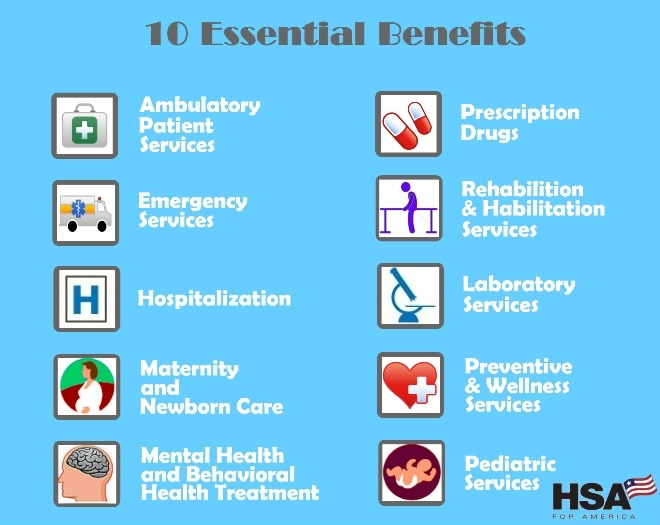 All insurance policies (but not healthshare plans) must include these ten Essential Health Benefits, unless you have a grandfathered or grandmothered health plan. Here is the current list of individual- and employer-mandated Must-Haves. All plans must include complete coverage for many services that enhance early detection, or prevent additional health problems. Covered benefits range from prenatal and pediatric coverage to cancer screenings for early detection. These Wellness and Preventive Care Services are available at no additional cost to you as long as you choose a healthcare provider within your network. Six basic screening tests provided for all adults are covered 100 percent. These screenings include blood pressure, depression, obesity, sexually transmitted disease, smoking cessation, and certain vaccines (including flu shots). Selected screenings include pertinent counseling and medications where indicated. Women’s health screenings are covered for birth control, breastfeeding counseling and supplies, and domestic violence screenings with counseling services. Children 18 years and younger are 100 percent covered for health screenings, many of which were too costly for families in the past. Screening exams including hearing tests, dental and vision care, immunizations, developmental and behavioral health and many others. Additional information is available on our Preventive Care page. Under the Affordable Care Act, you are required to be enrolled in a plan that is compliant with the qualified essential benefits. If you already had a plan in place before the law was signed, you have a grandfathered plan. In other words, your existing coverage is grandfathered in. Some carriers do allow you to keep your plan, however, keeping your old plan may not cover you under all of the essential benefits, specifically if you have a pre-existing condition. Pre-existing conditions areno longer a disqualifier for eligibility of coverage under the new law. The Affordable Care Act has divided levels of coverage into four categories, referred to as metal tiers called Bronze, Silver, Gold and Platinum. The least expensive plans is the Bronze plan, while the most comprehensive and expensive is Platinum. The amount that each level is required to cover is based on a calculation called the Actuarial value, such as: Bronze = 60 percent; Silver = 70 percent; Gold = 80 percent, and Platinum = 90 percent. The actuarial value refers to the percentage of expenses that the plan will pay for a typical policy-holder, during a typical year. All health plans have a limit to how much you share in the costs of your health care, also known as the out-of-pocket maximum. In 2018, maximum out-of-pocket expense is $7,350 for an individual, or $14,700 for families. People with lower incomes have lower out-of-pocket maximums. Individuals making between $12,140 and $30,350 and families making between $25,100 and $62,750 qualify for cost-sharing to reduce their annual maximum out-of-pocket expenses. This means the policyholder will pay smaller copays with less coinsurance as well. What Exactly is Actuarial Value? Simply put, Actuarial Value is an estimate of the overall financial protection provided by a health plan, and what that plan is likely to pay across a typical covered population. The actuarial value measures the percentage of expected medical costs a health plan will cover. The four metal plans we’ve talked about (platinum, gold, silver, and bronze) are different because of the actuarial values attached to each. For example, the Silver plan has an actuarial value of 70 percent. This means that the plan will pay 70 percent of health care expenses for the standard population, while the individuals themselves will pay 30 percent over deductibles, copays, and coinsurance. Higher actuarial value results in less cost-sharing. The percentage a plan pays may differ from the actuarial value, depending specific use of certain services. Young adults have historically comprised a large percentage of uninsured Americans. Young adults typically enjoy relatively good health and frequently work jobs that do not offer health care benefits, forcing young adults to forego health coverage. Under the new Individual Mandate, this is no longer be an option. The Affordable Care Act requires everyone to carry health insurance—including young, healthy adults. Unfortunately for younger people, the pricing structure requires that their premiums be higher to subsidize older people and the segment of the population who use more health care services while paying less in premiums. A special option for individuals under the age of 30 is a catastrophic plan with a deductible of $7150. Under the catastrophic plan, preventive services are also covered completely, along with three annual primary-care visits. Catastrophic plans are also available to very low-income recipients in some states that have expanded their Medicaid coverage. Be sure to check rates carefully, because often the Bronze-level HSA-qualified plans are still a less expensive option for those under age 30 than a catastrophic plan. If you qualify for premium assistance, an ACA health plan is likely the best value. Implementation of the Affordable Care Act continues to have a major impact on anyone who purchases their own individual or family health insurance. Many people who do not qualify for a subsidy are facing much higher premiums. People who do qualify for a subsidy can significantly lower their monthly premium, sometimes by as much as 75 percent. We believe in removing the complexity, and making your choice simple. Our mission is to help you choose the coverage that is best for you and your wallet. The least expensive health insurance plans considered compliant with Obamacare are Bronze-level HSA-qualified plans. For people in relatively good health, this is usually the smartest way to go, if an HSA plan is available. An even less expensive option is to opt-out of health insurance by joining a healthshare plan. These are faith-based plans that will only accept people who sign a pledge of faith, but they are dramatically less expensive than health insurance plans. You can reduce your costs further by fully funding your Health Savings Account (HSA), since this will reduce your gross income. If you qualify or are close to qualifying for subsidies, your HSA contribution could change your income bracket enough to increase your subsidy. There is never a cost to use HSA for America’s services, and our team of Personal Benefits Manager will guide you through the best strategies for you and your family to survive and thrive during this time of health care reform. Call us today at 800-913-0172 and we’ll help you make sense of the options, and help you figure out what will work best for you. You can also visit our Guide to Open Enrollment web page for important open enrollment dates and deadlines and to sign up for a health plan.